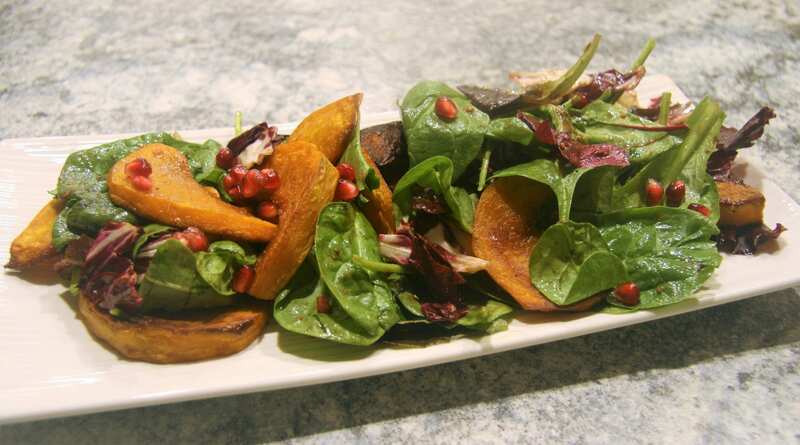 Roasted Squash Salad with Pomegranate - Wholly Delish! A change of season means a change in what we’re eating. The weather this year has been all over the map – one day balmy and another chilly. The leaves are weirdly green for the end of October and my lawn is still visible beneath an oddly light scattering of leaves. Nonetheless, the air has a distinct fall feel to it and, since Thanksgiving, I’ve been excitedly pouring over cookbooks and blogs for fall foods inspiration. I’ve been experimenting with all things squash, fennel and cauliflower. Warm roasted flavours to warm our bellies…but that doesn’t mean I’ve abandoned my love of salad! So, for my first fall themed recipe of the season, I share my fall salad go to for 2017 – roasted squash salad with pomegranate which delivers the warmth my body craves with a tangy sweet lightness that makes this a perfect side for a heavier entree or a satisfying lunch on its own. Cutting the sweetness of the squash, pomegranate and balsamic dressing is a background of bitter from the brightly coloured radicchio (a personal favourite). I use Kabocha squash – a Japanese winter pumpkin which is widely available in North America. I love the sweetness of this squash (sweeter even than Butternut) and its pumpkin-y texture. I’m able to find it at both local supermarkets and have been making a point of stopping in for farm fresh ones from a local favourite market – Burnham Family Farm. If you can’t find Kabocha where you are, I suggest using Acorn Squash. Acorn is not as sweet, but has the same hearty texture and can be sliced into the same interesting half moon shape that gives this salad it’s hearty appearance. I’ve been serving this weekly, usually accompanied by Sage and Onion Stuffing Mushrooms (recipe coming soon) and some green beans (a surprising new favourite for my toddler who will literally eat them by the handful!) I have also made it as a nice seasonal accompaniment (mostly for us grownups) to our usual pizza on Friday’s pizza and movie night. However you choose to serve this Squash Salad with Pomegranate I’m sure you’ll find yourself going back for more! Preheat oven to 375°. Peel, seed and slice the squash. Place squash on a large baking sheet, drizzle with 2 tbsps of oil, sprinkle with salt and pepper and toss well to coat. Bake for 15-20 minutes until cooked through and slightly caramelized. Meanwhile, seed the pomegranate and prep the radicchio and add to a large bowl with the greens. In a small bowl, whisk together the remaining oil, balsamic, Dijon and a pinch of salt and pepper. Just before serving toss the salad with the dressing. Make a bed of salad on a platter and then top with roasted squash and sprinkle with the pomegranate seeds. Toss lightly.